About 20% of Germany’s electricity now comes from renewable sources, and the feed-in tariff for renewables has been very successful in getting the public to participate in generating electricity from solar. However, it has been widely reported that the government intends to curtail financial support for renewables, particular for solar energy, and industry analysts doubt the renewable energy industry could survive without it. It seems that Germany is not only having issue with sustaining and growing further its renewable energy industry but it is now faced with another obstacle in one of its GHG emissions reduction related initiatives. Official said that, unless more incentives are given, Germany will miss its target of 1 million electric cars on its roads by 2020. 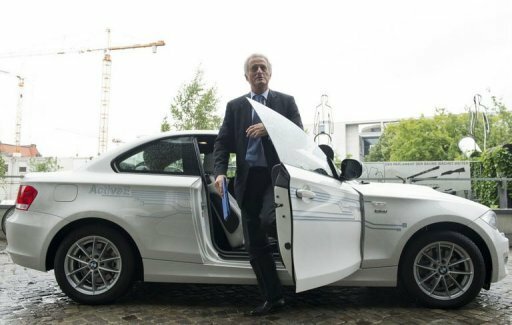 German Transport Minister Peter Ramsauer gets out of an E-drive BMW electric car. Germany will miss its target of one million electric cars on its roads by 2020 without more incentives, the country's coordinator on electric transport policy warned on Wednesday. "I've already said that without additional incentives we will reach more of a figure of half a million," Henning Kagermann, who oversees Germany's electric mobility strategy, told reporters. Germany set a target in 2008 of having one million electric cars on its roads in 2020 and said it wanted to be a pilot market in the field. Under the plan, it has given itself until 2014 to prepare the market, with mass production of electric cars due to kick in from 2017. But Transport Minister Peter Ramsauer called at the same press conference for "optimistic realism" and spoke of "making Germany the number one (market) for the electric car" rather than re-stating the one-million target. The head of the powerful Federation of German Industry (VDA), Matthias Wissmann, has said that by 2014, German manufacturers will be able to offer 15 different models of electric vehicles. But he insisted on the need to improve the vehicles' batteries to provide electric cars with more autonomy outside heavily built-up areas. The government offers tax incentives to electric car drivers but campaigners say much more must be done to encourage people to switch from petrol or diesel to electric vehicles.